Thanks to all commentators for the very useful responses to yesterday’s posting. I shall now with confidence add to the next edition of LPD (when and if there is one) as follows. While on the subject of Irish, I notice that on the American voice association’s email list a lady from Texas is asking about the pronunciation of the name of the western province of the Irish Republic, which she gives as Connaught. Anybody out there know whether the emphasis in Connaught Province is on the second syllable? Pronunciations online seem to indicate a slight emphasis on the first syllable. My director, who lived in Ireland (but is in no way a vocal coach) seems to insist that the emphasis is on the second syllable. Straightaway she got a reply from a voice teacher in Maryland. I have always heard it pronounced with the stress on the second syllable. The first syllable is not 'thrown away', but de-emphasized. Interesting. See how what appears to be misinformation disseminates. Perhaps it is true that in America you “always” hear this name given second-syllable stress. But that’s not what you hear in Ireland, or indeed in Britain. The only pronunciation I have ever heard is ˈkɒnɔːt, with initial stress. Connacht (pronounced /ˈkɒnəxt/, /ˈkɒnəkt/ or /ˈkɒnɔːt/ —Irish: Connachta / Cúige Chonnacht —pronounced [ˈkɔnəxtə]), formerly anglicised as Connaught. Indeed, we nowadays spell the name of this province as Connacht. We retain the old spelling in the case of the Duke of Connaught, a dukedom now extinct, and in various placenames and street names. The enquirer was talking about a play, A Lie of the Mind, whose author, Sam Shepard, no doubt uses the old spelling. I suggest in LPD that for Connacht, though not for Connaught, we can reduce the second vowel to ə, as happens in Irish. Next time I ought to add the Irish-language pronunciation, too. As any fule kno, these should be “żurek” and “blåbärssoppa” respectively. Though why someone might want three kinds of soup at the same time I have no idea. I shall be away for the next two weeks. Next blog: 14 November. Let’s try a bit of crowd sourcing. How do we pronounce uillean or uilleann, as in uillean(n) pipes? Please do NOT respond if you’re not familiar with this word. Tell me what you say ONLY if you have heard other people use it in English, and particularly if you commonly use it yourself in English. If you are a speaker of Irish please tell me how you pronounce it in Irish, too. doesn’t have ‘uillean (pipes)’, [a word] that is guaranteed to give English speakers problems. Collins English Dictionary gives only /'u:lɪən/. I may be wrong – I guarantee nothing – but I thought it was more commonly /'i:lɪən/. In my reply I mentioned that Wikipedia says it’s pronounced ˈɪlən. This is also what is given on an American website for enthusiasts. I have now looked it up in the online OED, too, where I find the pronunciation given only as ˈɪljɪn. Etymologically, the word appears to be the genitive singular of the Irish word for ‘elbow’, variously given in the nominative singular as uillinn (my Learner’s English-Irish Dictionary, and online here) or uille (Wikipedia, the OED s.v. 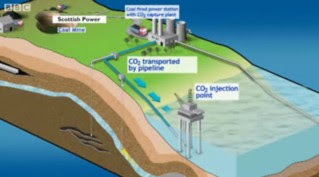 union pipes, and the image shown alongside). Another source says it is an adjective meaning ‘acute-angled, having a sharp elbow or angle’. However, as the Wikipedia article recounts, it is also possible that it is really a reworking of the English word union. To hear what uillean pipes sound like, go here and follow the links on the righthand side; or here. Meanwhile I’ll ask around at the EFDSS and the London Irish Centre. As regular readers will know, I am always on the lookout for English intonation patterns that are not predictable on the basis of the general rules we know about, and which I have attempted to record in my book English Intonation. Each case that we discover can be seen as demonstrating the inadequacy of the existing rules. This is not something to be upset about. Rather, it helps us work towards a fuller account of the language and of what native speakers implicitly know about it. Linguists are not content with vague hand-waving in the direction of ‘sprachgefühl’ every time we are faced with something we cannot explain. We seek a fuller, more principled account. I’ve been thinking about the phrase I don’t know. Apart from its obvious use to say that one doesn’t know some fact or the answer to some question, we also sometimes use it to demur — that is, to show that we disagree slightly with what has just been said. How do people typically demur? Politely. Politeness being what it is, we also use this phrase, in BrE at least, to show that we disagree strongly (rather than slightly) but don’t wish to enter into an immediate fierce argument. Here’s LDOCE’s example of this usage (s.v. know 21 c). What intonation would be appropriate for I don’t know in this sense? I think it has to be a rise. \Oh, | I ˌdon’t /know. Ah, say followers of Brazil’s theories, that’s because we’re referring (to our lack of knowledge) rather than proclaiming it. To which I reply, but how do you know? 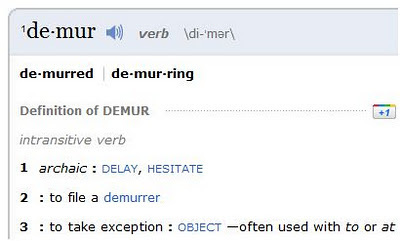 Why should demurring be referential, whereas straightforward disagreement is proclamatory? It sounds nice as a post-hoc explanation, but if you were a NNS and needed to use this phrase — say, as an actor in a play — how would you know that a falling tone is inappropriate and that you should use a rise? On Saturday I looked in at the London Language Show: 150 stands and three seminar rooms, exhibitors ranging from language schools to cultural bodies to publishers to travel agencies (they arrange student visits abroad). Over the three days of the show there were ‘taster’ sessions on Arabic, Czech, Chinese, Esperanto, Finnish, French, German, Greek, Hindi, Italian, Japanese, Korean, Polish, Portuguese, Russian, Spanish, Turkish, and British Sign Language, plus intensive classes in a subset of these and a whole range of seminars. On the CUP stand I was able for the first time to have a look at the new (18th) edition of the Cambridge EPD. Visually, the most striking change is that the coloured type in the body of the dictionary, blue-green (teal?) in the 17th edition, is now light brown (tan?). The contents include six short essays by outside contributors. Transcription-wise, the most important change is that words such as tune, duke now have the tʃ, dʒ form prioritized. This is what my own preference poll reveals to be the most widely preferred BrE form, but I still find it a bit shocking. I noticed two exhibitors at the show specializing in offering pronunciation tuition. I was attracted to one stand by the large chart of phonetic symbols for English displayed — refreshingly error-free and well presented. The young lady on duty at that stand turned out to hold a master’s in Phonetics from UCL: this was after my retirement, so I had examined her but not taught her. A difference from previous years was the unusually high profile presented by two particular languages: Polish and Mandarin Chinese. All the more reason for us to drill our students diligently in the difference between ɕ, ʑ and ʂ, ʐ. In a week I shall be off to Japan, for a conference in Kochi (here’s the programme). I hope to see some of you there. Afterwards I shall also be giving lectures in Osaka and Kyoto. My question is: What should we call that pronunciation model? Is there any new publication with revised and updated data on RP? At UCL we sometimes referred to it (not altogether seriously) as “son of RP”. Jack Windsor Lewis tried to popularize the term "General British", but it has not found wide acceptance. In our Practical Phonetics (1971) Greta Colson and I used the name "Southern British Standard". Given that RP is supposedly not localizable within England, this term relies on people’s appreciating that Southern British means ‘of southern Britain’, i.e. ‘of England, not Scotland’. (Technically and historically, North(ern) Britain is Scotland, while South(ern) Britain is England-and-Wales.) But I’m not so sure that everyone is mindful of the difference between Britain and England. More recently the term "Standard Southern British English" (SSBE) has become popular. I noticed it quite a few times at the Hong Kong ICPhS two months ago. The Bristol accent also defeated them. ‘What do you do when the fabric tears?’ asked a young boy, only to be met by total incomprehension until his enquiry was translated into received pronunciation. (i) it uses the term ‘received’ in a meaning that is now unusual, namely ‘accepted or considered to be correct by most people’. We do still speak of ‘received opinions’ and the ‘received wisdom’, but that’s about it. (ii) the social landscape has changed out of all recognition since the term was first used (by Walker in 1774; by Ellis in 1869; by Jones in 1926). I’ve pointed out elsewhere that there are various sets of criteria by which we might try to define RP: sociolinguistically, by examining the speech of the people at the top of the heap; ideologically, by reference to correctness or what is perceived as correct or desirable; and pedagogically, as a convenient codification of the pronunciation model we teach to BrE-oriented learners of EFL. 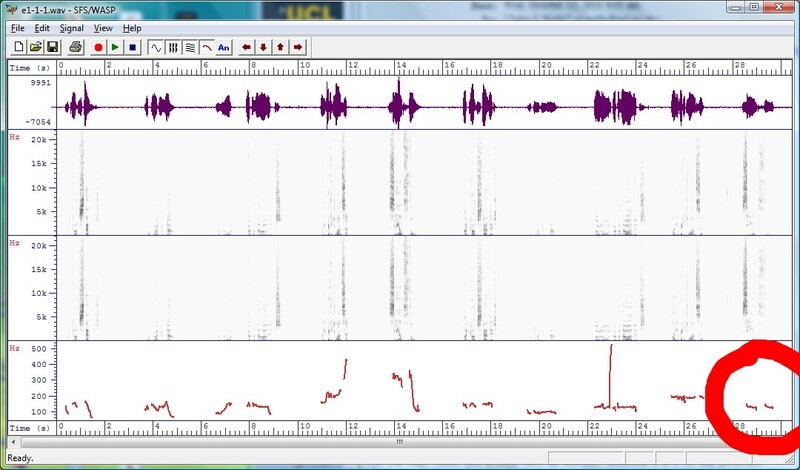 In LPD I claim that the model of BrE pronunciation that I record is “a modernized version of … RP”. 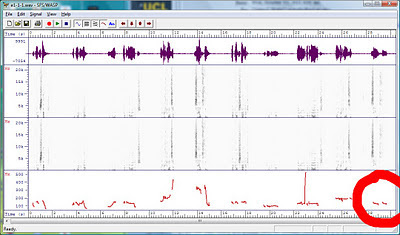 In England and Wales, RP is widely regarded as a model for correct pronunciation, particularly for educated formal speech. 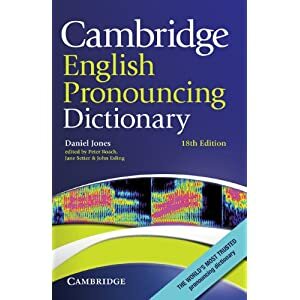 It is what was traditionally used by BBC news readers — hence the alternative name BBC pronunciation, although now that the BBC admits regional accents among its announcers this name has become less appropriate. Others have other definitions, or use other terms. I’m sure readers have views on this. I refer you to a horror story reported in Alex Rotatori’s blog. The above is part of a page in an English phrasebook published in Italy by a respectable publisher. It’s not just a question of possible typing errors or misprints such as [intʃ] instead of [ɪntʃ] inch. What we have here is gross ignorance on the part of the author about the ‘phonemic spelling’ of English words. • Leaving aside the Scots and Ulstermen who have no GOOSE-FOOT contrast, every native speaker of English pronounces foot as fʊt, not fuːt. Indeed, I chose FOOT as my keyword for the lexical set that includes put, push, and good. • Every NS of English pronounces pint as paɪnt (i.e. with the PRICE vowel), not pɪnt. • Every NS pronounces gallon with -lən, not -lɪən. • No NS of English pronounces ounce as oːnts. We all use the MOUTH vowel, which may range depending on our accent from [æə] through the customary [aʊ] and [ɑʊ] to [ɔʊ], but is never oː. 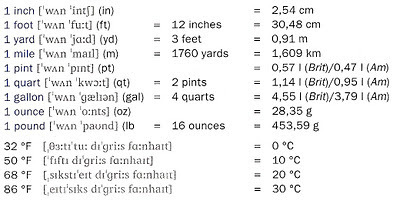 • As far as I know, no NS pronounces Fahrenheit as ˈfɑːnhaɪt. Most of us say ˈfærənhaɪt. • The citation form of the plural of degree ends in z. OK, there may be some contextual devoicing, but the appropriate entry in a list such as this is -ˈɡriːz. • Because of the operation of the ‘stress shift’ or rhythm rule, for a NS the stress pattern of eighty-six in the expression 86 degrees is normally TUM-ti-tum rather than the citation tum-ti-TUM given here. Of the thirty transcribed forms in this tiny fragment of the phrasebook, fifteen are wrong. The Pons Travel Kit Inglese, according to the cover, comes con Audio Trainer. I do hope they got a native speaker to make the recordings. If they did, and listened to what the NS said, they would have been able to avoid these howlers. As I say, Pons is a respectable publisher, based in Germany. They ought to be ashamed of themselves. I think teachers of English pronunciation need to give a lot of attention to establishing the correct target for the pronunciation of each word in the student’s English vocabulary. Knowing the spelling is not enough. We’re all aware that the relationship between spelling and pronunciation is less than perfect. But we often don’t realize how insidious the misleading effect of the orthography can be. Wild guesses are not the route to follow. Presumably the author of the phrasebook knows English fairly well. He or she may even have a degree in the subject. But clearly this relates to the written language rather than the spoken. It’s not just a matter of learning to make the sounds of English in an acceptable way. It’s also a matter of knowing which sounds ought to be used in which words. And that’s what often gets neglected. I remember Gimson, probably sometime in the 70s, telling me that Jack Windsor Lewis was trying to convince him that he ought to change the EPD entry for government so as to prioritize the variant in which there is no n before the m. Gim didn’t think much of this idea, and continued to prioritize the pronunciation ˈɡʌvnmənt. In his CPD (1972) Jack transcribes this word as ɡʌvm̩ənt, and entirely iɡnores the possibility of n before the m. See also his comments in §10 of this review. the term government … can be heard every day over and over again in countless news bulletins and current affairs programmes. Both EPD15 and LPD list first the variant which contains the /-nm-/ sequence. However, anyone who listens at all attentively to recordings will soon discover that this is not merely not the predominantly heard form of the word, even in situations of the greatest prominence or highlighting, but that it is actually even a relatively unusual form of it. In my opinion, it requires a great deal of effort to articulate the <-nm-> sequence without assimilating the n to the m. In Italian, San Mauro is sa'm:auro not san'mauro. It seems to me that mm is not a variant/change in progress, but the rule. I think my entry is correct. It unquestionably corresponds to my own slow-careful pronunciation of the word. I certainly don't have to make “a great deal of effort” to pronounce it as shown. (But then my L1 is English, not Italian or Japanese.) The alternatives that follow represent reductions which are also admittedly very common in speech - but they are just that, reductions. I am in no doubt that for me (at least) ˈɡʌvənmənt accurately represents the succession of articulatory targets presumably stored in my mental lexicon as the phonological specification of this word. As I told GF, it also represents the way I pronounce it when articulating carefully (not overarticulating, but also not applying running-speech reductions). Some of these reductions may indeed be frequently heard from speakers, in radio or TV news bulletins as elsewhere. That does not make them the mentally stored forms, which are what I think a dictionary ought primarily to record. — how would you analyse that grammatically? In this structure there don’t seem to be any other possibilities for the first slot, well. The only other possibility in second place seems to be played. The third slot can be a proper name or some other NP. It can also be a prepositional phrase with to. Although the syntactic structure appears to be elliptical, it is not clear what has been ellipted. 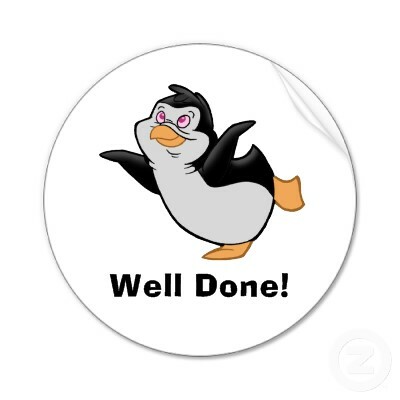 It would be ungrammatical, in modern English at least, to say *You have well done. The only permitted word order is You have done well. Even That was a job well done has an unusual word order. That problem aside, what is the syntactic role of the final NP here? If it is a personal name, then you might think that it was a vocative. There are two difficulties with calling it a vocative (except in the last example). 1. You can use this structure even if the person designated by the NP is not present. You can comment Well done Thomas even if Thomas is not in earshot. And the me of Well done me! can hardly be a vocative: you can say this while talking (boasting) to someone else. He faced them down, so well done Obama, I say. 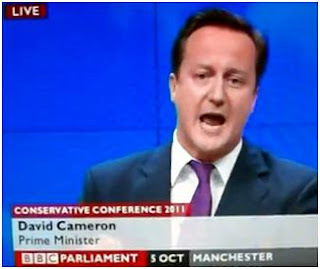 He won the vote, so well done the Prime Minister. 2. In intonation, final vocatives are usually not accented. ˈWell ˈdone \me, | ˌdon’t you /think? 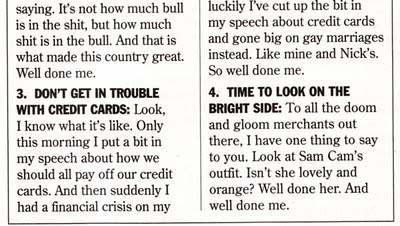 In the current issue of the satirical fortnightly Private Eye there’s a spoof of Cameron’s conference speech (blog, 6 October). 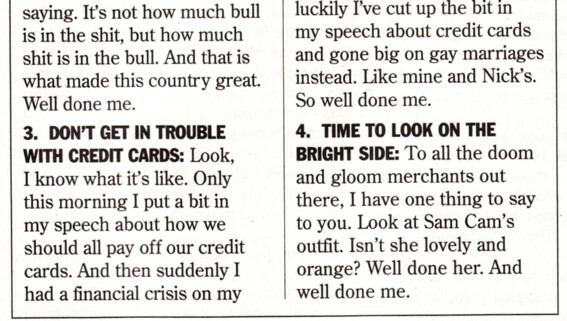 Each paragraph ends well done me. If you read it aloud, the only plausible intonation is with the nuclear accent on me each time. The first exercise in my book English Intonation (CUP 2006) asks the reader to observe and imitate the difference between speaking ‘normally’, i.e. with intonation superimposed on the phonetic segments of the utterance, and speaking on a monotone. E1.1.1 Listen to the following sentences spoken (i) normally and (ii) strictly on a monotone (= the pitch of the voice stays level, not going up and not going down). Repeat them aloud in the same way. Is a low falling nuclear tone considered a monotone? The answer to that question is of course no. I have listened again to the sound clip. I still hear not a low fall but a low level pattern, i.e. a monotone. Do you, too? As you can see, the tracing for the fundamental frequency for the bit we are interested in (ringed in red) does seem to show two slightly falling tones. On the face of it this looks like that bugbear of intonation work, a mismatch between what the human ear perceives and what physical measurements of the speech signal tell us. Then again, Jacob Chu must either be a native speaker of Cantonese or at least very familiar with it. 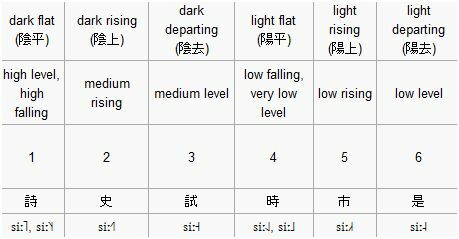 And Cantonese tone 4 is described as “low-mid to low, falling” (the IPA Handbook) or “low falling, very low level” (Wikipedia, see graphic). In Daniel Jones's description (Principles of the IPA, 1949) tone 4 is described as "low falling (with very low level as a common variant)", tone 6 as "low level (...but higher than the variant of [tone 4])". 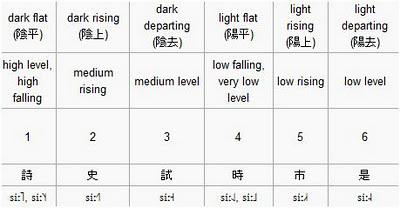 This would suggest that speakers of Cantonese might well find it difficult to hear the difference between low fall and very low level, since both map onto their tone 4 (as against a not-maximally-low low level, which maps onto tone 6). Could it be that Jacob’s L1 is influencing his perception? Or is it my L1 influencing mine? Or do we just say that different people sometimes hear the same physical reality differently? 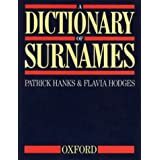 I estimate that the Oxford Dictionary of Surnames by Patrick Hanks and Flavia Hodges (also published as part of the Oxford Names Companion) contains about 35,000 surnames with their etymologies or origins. Yet the number of surnames in Britain must be many more than that, judging by names that crop up in the news but are not to be found in the ODS. And that is without considering names of recent arrivals from other countries. If we add in other English-speaking countries, particularly the United States, the number of current surnames is very large indeed. 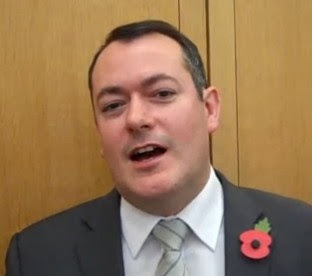 The current crop of Members of Parliament includes one Michael Dugher. I came across his name in the newspaper and was wondering how it would be pronounced. It looks vaguely Gaelic: compare Irish dúghlas ‘dark green’ and its Scottish Gaelic equivalent, which have given us Douglas. But it is not to be found in the ODS. Thanks to Jo Kim for pointing me to a short video clip in which Mr Dugher says his own name as he identifies himself. This is part of a series of brief goodwill messages from MPs to British troops serving abroad. As you can hear, he pronounces his surname with the STRUT vowel, as if it were spelt Dugger. As a dictionary entry we would write ˈdʌɡə. Since he speaks with a noticeable northern accent (born and raised in Doncaster, south Yorkshire), he makes no distinction between the STRUT and FOOT vowels, so that this actually comes out more as ˈdəɡə, ˈdʊ̈ɡə. The preceding clip on the same website is spoken by Mary Creagh, MP for a neighbouring constituency. She says her name as kreɪ, which is what you would expect. According to the ODS this is a variant of Cray, and is an anglicized form of Irish Ó Craoibhe ‘descendant of the curly-headed/prolific one’. Another MP with a northern accent (born in Rochdale, Lancs.) is Simon Danczuk. He pronounces his name as ˈdæntʃək. (Is the second vowel his STRUT vowel or his schwa weak vowel? This is perhaps a meaningless question. In any case, on the clip he devoices it completely.) This name is not in ODS. It looks as if it would be a Polish diminutive of Dan(iel). Such video clips offer a useful type of straight-from-the-horse's-mouth resource that was simply not available to lexicographers until very recently. How can we popularize phonetics to a lay audience? Grab yourself 10 minutes to show off absolutely anything about science. Got a demo, sketch, song, video, talk, performance, dance or anything else about science that you’d like to try out in public, or show to a new audience? Bring it to Science Showoff. Jane and Tim are both tutors on the UCL Summer Course in English Phonetics, as well as holding academic posts at Reading and Kingston universities respectively. They are also both talented singers, with plenty of experience as performers. Their set comprised some elementary phonetic theory illustrated with two songs, In summer in London and Doing intonation. You may recognize the tunes. I’m afraid there is no video available. There is a (rather poor-quality) sound recording here. You can listen to it while following the script here. Enjoy the audience participation. Here's an old picture of Tim and Jane with students at the summer course. Have a look at this clip. …was revealing, and not only of the oceanic distance that now separates British conservatives from their counterparts in the US, where such a statement is unimaginable from someone in Cameron’s position. It also supplies us with an excellent example of how intonation disambiguates what would otherwise be a structurally ambiguous assertion. On paper, the words I don’t support gay marriage might seem to imply that Cameron doesn’t support gay marriage. But if you listen to the clip (and are sensitive to English NS intonation) you will see that he is saying precisely the opposite. He does support gay marriage. He thinks that this support is not opposed to Conservative principles, but follows from them. Like all marriage, gay marriage is a form of commitment, and he’s all in favour of people being committed to one another. The fall-rise tone has a special function in a negative sentence. Namely, it indicates that the scope of negation includes the word bearing the nucleus, but not the main verb (unless the main verb itself bears the nucleus). A falling tone, on the other hand, does not restrict the scope of the negation in this way. I can see now that this wording is not quite correct. It does not cover cases like this, where the speaker chooses to divide his assertion into two intonation phrases, which means there are two nuclei. Here, it is the fall-rise on spite that marks its inclusion in the scope of the negation (‘I support gay marriage, but not in spite of being a Conservative’). To illustrate this point in my book I chose an example which is (I hope) easier to grasp. How many foreign learners, and of what language background, immediately get this intonation distinction? What other languages disambiguate the scope of negatives in this way? What are the implications for mutual intelligibility between NSs and NNSs? Myra Wandry asked about the pronunciation of “St. Maartens”. She meant the Caribbean island. This island is divided in two. The southern half is Dutch, the northern half French. (Click on the map to enlarge it.) The border between them is the only land frontier between what is technically the Netherlands and France respectively. The Dutch name of the island is Sint Maarten sɪnt ˈmaːʁtə(n). Its French name is Saint-Martin sɛ̃maʁtɛ̃. In English it is known as St Martin (BrE) or Saint Martin (AmE), pronounced respectively as sənt ˈmɑːtɪn and seɪnt ˈmɑːrtn̩. The three syllables of this name manage to exemplify four phonological variables. First, there is the prefix Saint, typically reduced in BrE to the weak form sənt or some further reduction thereof (sn̩t, sn̩ʔ, sn̩, sm̩ʔ, sm̩). Americans generally retain the strong form, seɪnt, perhaps glottalling the final plosive (seɪnʔ). Next there is the rhoticity variable. Historical r is lost in most accents of England and Wales where nonprevocalic, but retained in most AmE. The t of Martin is not infrequently realized as glottal in AmE, where it is immediately followed by a nasal consonant. In BrE, where it is usually followed by a vowel (see next point) it is more likely to be alveolar. Lastly, there is the final syllable of Martin. In most BrE unstressed ɪ does not weaken to schwa before an alveolar obstruent or nasal (thus Harris ˈhærɪs, goblin ˈɡɒblɪn). In AmE, on the other hand, it usually does (so ˈherəs, ˈɡɑːblən). In AmE, accordingly, Martin usually rhymes with Parton, Barton, carton; in BrE, it usually doesn’t. After t or d, as usual, the schwa coalesces with a following sonorant to give a syllabic sonorant, i.e. ən → n̩. So Latin is pronounced ˈlætn̩ and Martin is pronounced ˈmɑːrtn̩. These in turn yield possible ˈlæʔn̩, ˈmɑːrʔn̩. Despite having Dutch as the official language, most of the inhabitants of the English Dutch side speak Caribbean English as their L1. Some speak Papiamento. One of the most famous things about the island of St Martin is the way aircraft landing at the airport pass just a few feet over a popular beach. The British government has announced the creation of three new enterprise zones to help the workers who are losing their jobs at Brough, Warton, and Samlesbury, we read yesterday. The Brough in question is not Brough under Stainmore in Cumbria but Brough-on-Humber near Hull. Like other English places with this name, both are pronounced brʌf (locally, of course, equating to brʊf). In Scotland things are different. There is some uncertainty about the first vowel sound in this latter place name. I know it as ˈsɑːmzbri, -bəri, though I see that in LPD I deferred to the BBC Pron Dict of British Names and prioritized ˈsæmz-. Either way, its pronunciation does not correspond particularly closely to its spelling. In fact it is pronounced more as if spelt Salmesbury — compare psalm sɑːm and salmon ˈsæmən. This YouTube video, too, calls it ˈsɑːmz- (or is she saying ˈsɒmz-?). Wikipedia baldly asserts that the etymology of the first part of this name is the Old English sceamol ‘ledge’. Ekwall’s Concise Oxford Dictionary of English Place-names is more cautious, saying only “Etymology obscure. If the name originally began in Sh-, the first element may be OE sceamol ‘bench’ &c. in some topographical sense such as ‘ledge’”. The earliest spelling recorded (1179) is Samerisberia, with Samelesbure in 1188 and Schamelesbiry in 1246. The English distinction between ɑː and æ is much more recent than that.